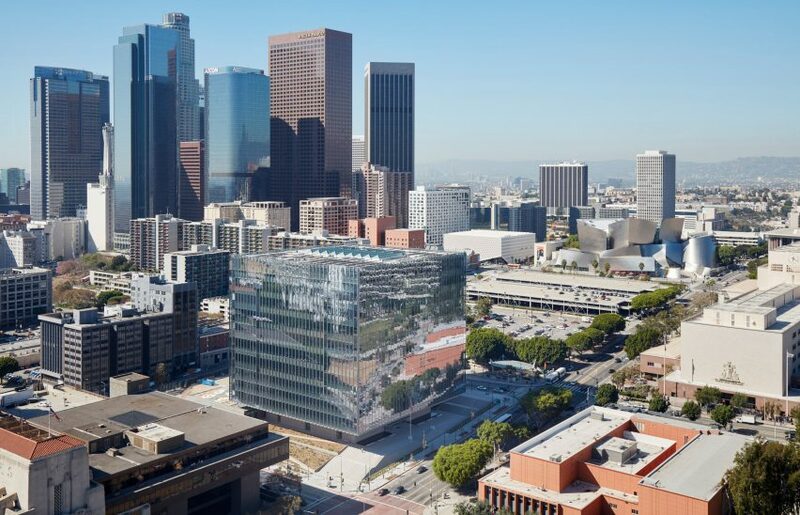 Global firm Skidmore, Owings & Merrill has designed and engineered a federal courthouse for a sloped site in Downtown Los Angeles, which appears as an elevated cube with folded glass facades. Rising 10 storeys, the urban courthouse is located on a prominent site in the city's Civic Center neighbourhood, a few blocks away from the Frank Gehry-designed Walt Disney Concert Hall. For the site, which has a 27-foot (eight-metre) grade change from the highest to lowest point, SOM aimed to create a building that is "both modern in spirit and rooted in classic principles of federal architecture". Envisioned as a floating cube, the glazed building cantilevers over a recessed stone podium. At ground level, the courthouse is fronted by a wide flight of stairs and a pathway that switchbacks across a garden. "It uses traditional architectural elements such as processional steps, grand public spaces, and enduring materials like limestone to achieve a strong civic identity," said SOM in a project description. The architects faced a number of challenges during the project. For one, they wanted to use glass for the exterior, but had to figure out how to manage intense sun exposure. 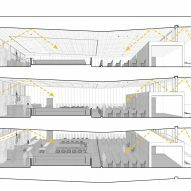 The team also wanted to align the building with the urban grid, which is slightly off-kilter in this part of the city — about 38 degrees off the north-south axis – making the control of heat gain extra difficult. To address these challenges, SOM designed a glazed curtain wall with vertical pleats. The folds help reduce the amount of surface area that is exposed to the strongest and most direct sun rays. 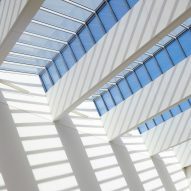 The glass panels also vary in opacity, depending upon their relationship to the sun. Opaque sections were used for parts that face east and west, where sun rays are most direct, while the north- and south-facing pleats are more transparent. Together, these features are expected to reduce solar radiation load by nearly half compared to a conventional glass facade. In addition to the pleated exterior, the building has an advanced structural engineering system that addresses seismic and security concerns. The structure consists of concrete shear walls that are positioned near the centre of the building. At the top, a roof hat truss system helps reduce seismic risks. "To protect against seismic events and control the building's lateral drift, the roof truss is used as a mega link beam that connects the reinforced concrete shear walls at the top story and reduces ductility demands," the team explained. The roof system plays a key role in other ways. Hung from the truss are steel columns, which act in tension to support the building's floor slabs and curtain walls. The hanging columns do not extend to the ground. Instead, they carry structural loads upward to the roof truss, which in turn transfers the loads to the shear walls, where they are then carried downward. 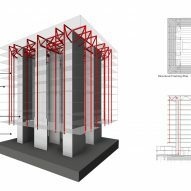 By having shear walls handle the structural loads – rather than perimeter columns – the building is less vulnerable to explosions, according to SOM. 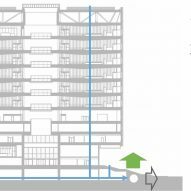 The structural design also enables the building's cubic mass to float over the recessed base. 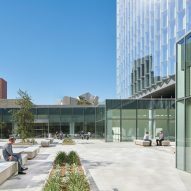 "The courthouse design mitigates blast threats by using a novel truss system to increase the standoff between the perimeter and primary structure, while still allowing the cube to appear as a single, hovering form," SOM said. Encompassing 633,000 square feet (58,808 square metres), the building contains 24 courtrooms and 32 judicial chambers. It houses the US District Court of the Central District of California, and provides trial preparation space for the US Attorney's Office and Federal Public Defender. It also accommodates the needs of the US Marshals Service, a law enforcement agency within the justice department. At the heart of the building is a 10-storey atrium that is flooded with soft light. This void is crossed by bridges and encircled by walkways with glass railings. In the courtrooms, clerestories bring in borrowed light from the atrium – a novel feature in a contemporary American courtroom. 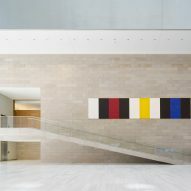 The team used a restrained material palette throughout the interior, including buff-coloured limestone and white marble in communal areas, and white oak in the courtrooms. The occasional splash of colour comes in the form of seating and contemporary artwork. Sustainability was a driving concern from the project's inception. Eco-mindful design elements include a rooftop photovoltaic array, LED lighting, drought-tolerant landscaping and water harvesting. Moreover, the composite structural design resulted in a "reduced carbon footprint compared to all-steel or all-concrete construction", according to the firm. The courthouse has received LEED Platinum certification, the highest level awarded by the US Green Building Council. With 10 offices around the globe, SOM has completed a wide range of buildings during its 82-year history. Recent government projects completed in the US by the firm include a biometric technology facility for the US Federal Bureau of Investigation, which is built into a hilly site in West Virginia, and a high-security, emergency call centre in New York City that appears as a metal cube with a textured facade. Photography is by Bruce Damonte unless stated otherwise.